Bombyx isn't the only rare showing up with patch 5.1. Over 100 rares have turned up in various Azeroth zones, bringing with them their sparkling personalities, several new skins, and a couple of gameplay changes for leveling hunters. Hey everyone! I'm here on the public test realm for patch 5.1, where Azeroth is overflowing with new tameable beasts. There are well over one hundred new rares of various levels for hunters to tame and more are being discovered every build. Though most of the new beasts have previously existing skins, some of them still break new ground. Low level shale spiders will give hunters access to the stat bonus buff at level 69 rather than having to wait until Deepholm. 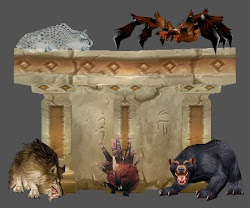 Other beasts provide an alternative option to previously unique skins, allowing hunters an extra opportunity to obtain the look they want in these days of cross-realm zones and heightened competition. A few of them bring unique looks outside of instances, making them easier to obtain alone. A good portion of the new additions sport completely new or previously unreleased skins, something that may appeal to hunters of any level. Regardless of appearance, the new rares bring a unique flavor to their part of the zone, giving players something new and exciting to discover when they're least expecting it. Many of them have a quirky sense of humor. Several others are incredibly sleepy. A few just like to run around wildly, while others stand with a purpose. And a small handful are just plain scary. Whether you're a hunter or just leveling through Azeroth, these new rare beasts are going to change the face of the landscape for the better. For more information on the new Azerothian rares and other hunter pets, be sure to visit Petopia and the Petopia forums. From all over Azeroth, this is Kalliope, showing you where the wild things are.